Apologies for the radio silence, between a terrible cold that resulted in the loss of my social life whilst at its peak and some housekeeping I've been doing on the blog I haven't had enough time to put together some posts. In case anyone's RSS feed went a little nuts with every single post on this blog, please please forgive me. I decided a little while ago that I wanted the address for my blog to reflect the name. To that end, I've changed the URL for the blog to GirlmeetsWolf.co.uk so that everyone who's using the Google Friends Connect widget* doesn't have to re-friend me on the new blog address. In order not to lose everyone following through other means I've recreated the blog with the old Welsh-Pixie address so that all old links will remain working. In the future, should I ever actually start making vintage reproduction children's clothes the Welsh-Pixie address will be available to me should I want it. However, it will no longer be updated with posts being published on Girl meets Wolf so please update your RSS feeds and bookmarks if you'd still like to receive my sporadic ramblings about anything that appears to enter my head. I've streamlined the look of the blog, some things - whilst pretty - just weren't working for me and were more irritating than helpful, so they have gone! I'm not going to be messing around with the template (hopefully) for a very long time! I am, however, going to go back and re-write my CSS tutorials after some conversations with Charly, so for the moment those are not available but will be popping back up. And as I finished with the BBC (for the second time in a fortnight) on Thursday I have more time for sewing! I'm looking forward to finishing (well, in some cases starting and finishing) the projects on my to-do list and sharing them with you. * Google announced recently it was planning on shelving Friend Connect, but I think (hopefully!) that didn't apply to the Blogger widget version. I need more Christmas ideas, does anyone know of any on Pinterest that I've missed? I discovered Clare's blog, A ZigZag Path, from a comment she left. Leave me links to your blogs so I can take a looksie, I love finding new reads! 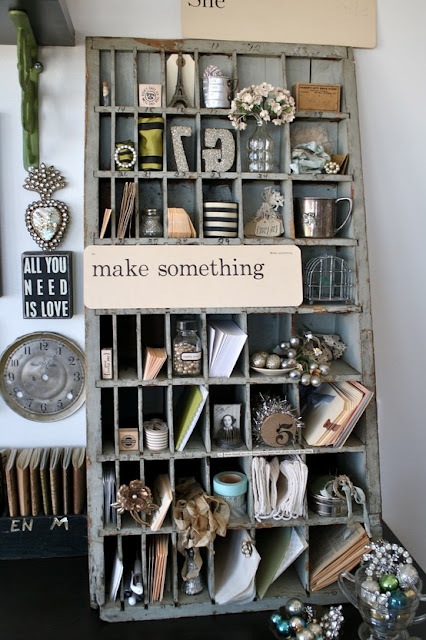 Looking for interior ideas on how to use vintage pieces to bring interest to your home? 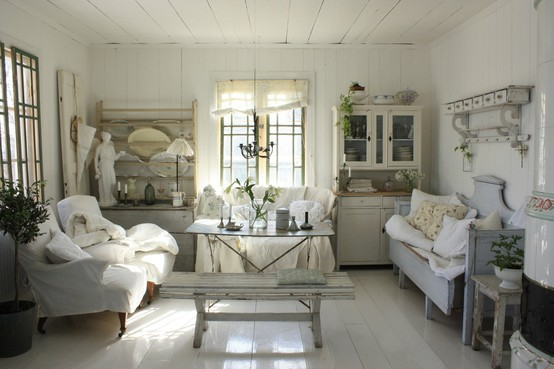 Check out The Vintage Inspired Home, mucho pretty pictures to drool over! Want a great tutorial on how to edit your pin-up style photos? Click here! I'm having a mini blogger meet-up with Lauren of Tea and Crumpets tomorrow. We were both a bit rubbish at photo snapping our day last time we met, here's hoping we're a little more snap happy this time! 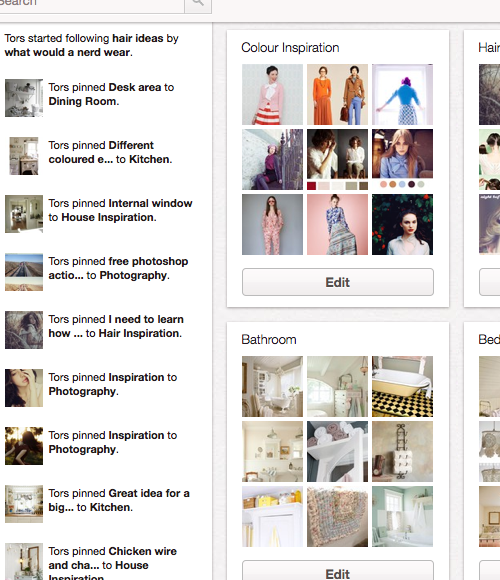 I wanted to do a brief follow-up to my How Do You Use Pinterest post a couple of weeks back because I found how everyone uses it really interesting. I'm very good at remembering things I've seen but find that the title of a page isn't going to stick in my memory, so a visual bookmarking system is perfect for me. I'm also slightly compulsive (I've mentioned this before) but I like to be able to return to something whenever I think about it to check something, review it or just see if there's anything else popping out at me that didn't before. Because of this I find it very interesting that Rachelle deletes her pins once she's acted on them and feels she won't need them again (she cited pins for a cat door and cellphone as examples). I'm assuming this means she's essentially pinning a shopping list, is that right Rachelle? I haven't yet explored using pinterest in that way, mostly because by the time I have the cash to buy the thing I've pinned it'll no longer be available, but I can see the appeal. I'm just not sure I could delete the pins once I'm done with them! Most of you seem to use it to bookmark and for inspiration. I still can't believe that Charly hasn't given in to peer pressure and that Popbabe's work ban it as social networking! 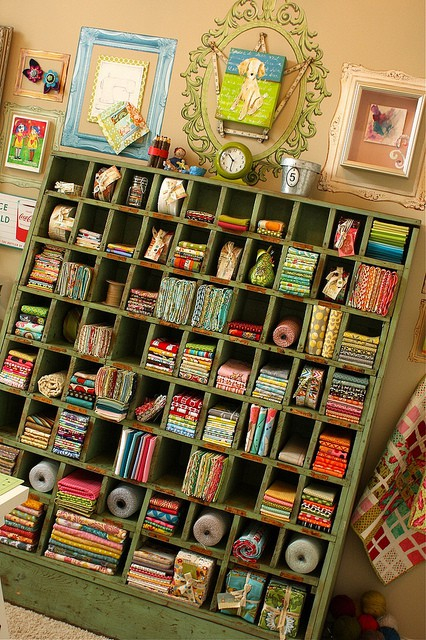 I love that Kristin pins things that are just because she loves them and she populates her fantasy house with them. I'm also incredibly impressed with her restraint, I can't keep away from pinterest and yet Kristin only checks a couple of times a week! I've managed to get almost my entire office hooked and am working on the rest of the BBC. I thought I'd talk about the choices I made, the inspiration behind them and the tutorial I used that resulted in my favourite piece of furniture in my house (to date anyway). That plan had been in place several months now, I'd even talked over building them myself with my Mum, and how we'd construct them. It stayed my plan right up until I visited some friends in the village who moved here around the same time as me and are also doing up their own house. They'd bought a lovely pine dresser from eBay for their dining room. 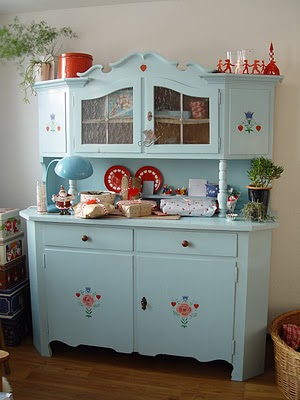 I love dressers, I'd just not thought about getting one as it didn't fit in with my idea of what storage I was after. After seeing theirs I completely changed my mind! 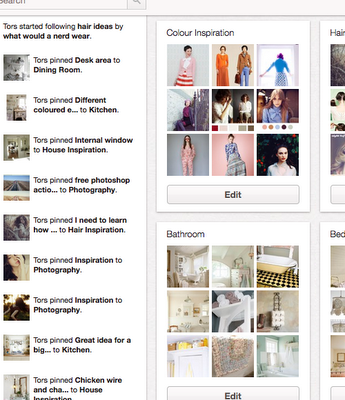 As it turned out, I had pinned a couple of pictures of dressers to my house inspiration board. The second was my direct inspiration for the style and colour of my dresser. I toyed with the idea of keeping the table top part natural wood to match my dining table but as it turned out it had been stained far darker and would have looked wrong. I was very clear that this was going to be my sewing cupboard, everything crafty was going to be stored in the one place. 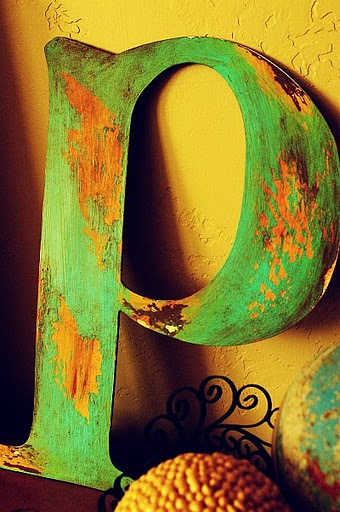 I also loved the blues and greens that shabby chic seems to be predominantly painted in. Picture #7 was a direct inspiration for the way that I wanted to shabby up the paint. I love the white and blue, and I did toy with painting the entire thing blue but I plan on painting the double doors to the lounge a light blue and felt that it would be too much to have another large piece of furniture the same or similar colour, and I do love white furniture. The corner the dresser's in doesn't catch an awful lot of sunlight, despite its placement right next to a huge window. The back faces north and between the mountains on either side and the house next door my little dresser's corner doesn't get very much sun, it made photographing it very difficult! Painting it white brings a little more much needed brightness to that corner of the room. I'd found a couple of tutorials on painting, pinned to pinterest of course! I loved the idea of pulling a colour through under the white and this tutorial offered just that. I didn't have any solid soap, so I borrowed the idea of a candle from this tutorial and it worked perfectly. I got a bit carried away and in a couple of places used the candle on the blue undercoat where I shouldn't have because I wanted blue and not wood, but live and learn! The end result is some great flashes of blue, not really noticeable but visible when you look. The ceramic striped handles were another eBay purchase and cost ... well, rather a lot actually, but are totally worth it! Aren't they great? The only real issue I came across (other than tired arms from all the damned painting) was the very large gaps above the doors on the bottom cupboard that hadn't really been noticeable when the wood was dark. As you can see, the white paint made it very noticeable! Luckily it was easily fixable and for less than £1! Usually, where drawers are built in to cupboards there are strips of wood running horizontally along the underside of the drawer to prevent just this sort of problem. In this case no such strip existed. In the picture below you can see the support for the drawer on the left, basically the drawer runner, but no wood under the drawer itself along the front as you'd expect. Have you painted your own furniture? Have you any tips? I've got several more pieces in mind to purchase that are all going to need to be re-vamped, any advice would be greatly appreciated! Firstly I just wanted to say a massive thank you to Sarah, Suzy and Sølvi (ooh, I alliterated and didn't even realise it!) for stepping in with guest posts at incredibly short notice whilst I was away. I don't know about you but I loved every one of them. Thank you girls, I couldn't have asked for better posts! So recently I took a road trip to pick up a dresser I'd bought with my friend, Scott, who came along as the muscle. The dresser was another one of my bargains off eBay, scored for £50. It wasn't until I'd painted it, re-attached the doors and added my new door knobs that I realised just why it was only fifty quid. Blurry certainly didn't do it justice, neither did the over-crowded room it was stored in. Scottie and I heaved my new dresser over a bed and around a drum kit, past the piles of boxes and out to my Mum's RAV4 borrowed specially for the occasion (via Bridgend and a cup of tea with cake). Thankfully, it fit. Driving very slowly, paranoid I was going to break the glass doors, I edged my way back home where Scott and I heaved it up the front steps, past the new-to-me eBayed front door (I don't think I've told you much about that yet) and past the dining room table to it's fireplace alcove. It was the perfect size. I discovered, when I put the doors back on, that everything was a little warped. Gaps around the bottom cupboard doors were hidden by the darkness of the wood, and highlighted once painted white. The glass doors also fit strangely and don't close properly. The holes for the handles have been drilled unevenly and the drawers are too thick for my new handles to fit through. It's a crude dresser, made from sub-standard pine that stank of cigarette smoke. And I love it ... well, apart from the smell. I've shabbied up the paint work, exposing the blue undercoat I gave certain areas. I still need to finish dressing it, I have some mini-bunting planned and I'm going to paint the wooden box green, but overall I'm very very pleased with the result. The glass cupboard holds all my patterns and my button jars, miscellaneous bits and pieces, and elastics. The drawers hold all my sewing paraphernalia that I don't want on display and the cupboards hold ... stuff. Deciding just what to put in it took a whole weekend, after three years of no storage in my dining room I was suddenly indecisive over just what I wanted to put away! All in all, definitely worth the effort. Still, I hope it's a long time before I have to paint any furniture again! Guest Post: My Favorite Sewing Tools!